An appreciation means an increase in the value of a currency. It means a currency is worth more in terms of foreign currency. 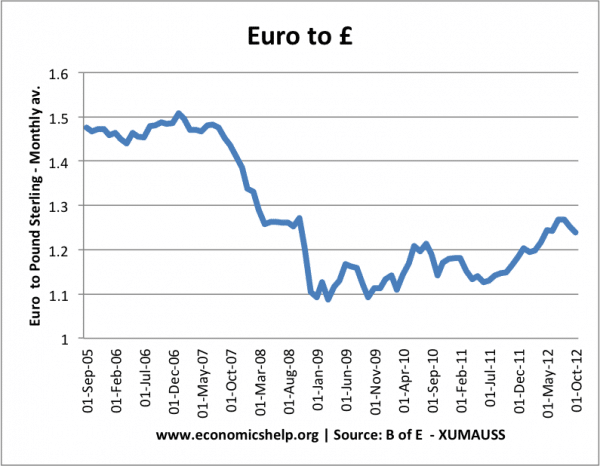 In this case, we can say there was a 15% appreciation in the value of the Pound against the Euro – between Jan 2009 and June 2012. Exports more expensive. The foreign price of UK Exports will increase Europeans will find British exports more expensive. Therefore with a higher price, we would expect to see a fall in the quantity of UK exports. Imports are cheaper. UK consumers will find that £1 now buys a greater quantity of European goods. Therefore, with cheaper imports, we would expect to see an increase in the quantity of imports. 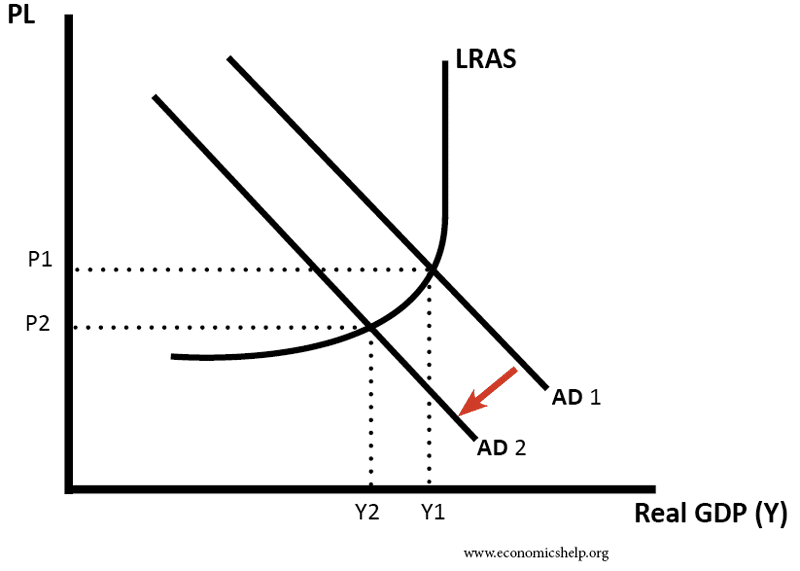 Lower (X-M) With lower export demand and greater spending on imports, we would expect fall in domestic Aggregate Demand (AD), causing lower economic growth. import prices are cheaper. The cost of imported goods and raw materials will fall after an appreciation, e.g. imported oil will decrease, leading to cheaper petrol prices. Lower AD leads to lower demand-pull inflation. With export prices more expensive, manufacturers have greater incentives to cut costs to try and remain competitive. 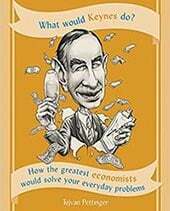 Assuming demand is relatively elastic, an appreciation contributes to lower AD (or a slower growth of AD), leading to lower inflation and lower economic growth. Assuming demand is relatively elastic, we would expect an appreciation to worsen the current account position. Exports are more expensive, so we get a fall in eXports. Imports are cheaper and so we see an increase in iMports. This will cause a bigger deficit on the current account. An appreciation will tend to reduce inflation. This can make UK goods more competitive, leading to stronger exports in the long term, therefore, this could help improve the current account. 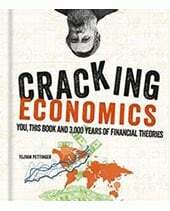 The impact on the current account depends on the elasticity of demand. If demand for imports and exports is inelastic, then the current account could even improve. Exports are more expensive, but if demand is inelastic, there will only be a small fall in demand. The value of exports will increase. If demand for exports is price elastic, there will be a proportionately greater fall in export demand, and there will be a fall in the value of exports. Often in the short term, demand is inelastic, but over time people become more price sensitive and demand more elastic. It also depends on what goods you export. Some goods with little competition will be inelastic. China’s manufacturing exports are more likely to be price sensitive because there is more competition. Elasticity varies over time. In the short run, we often find demand for exports and imports is inelastic, so an appreciation improves current account. But, over time, demand becomes more elastic as people switch to alternatives. The impact of an appreciation depends on the situation of the economy. 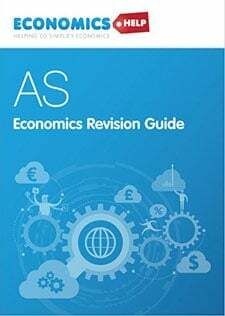 If the economy is in a recession, then an appreciation will cause a significant fall in aggregate demand, and will probably contribute to higher unemployment. However, if the economy is in a boom, then an appreciation will help reduce inflationary pressures and limit the growth rate without too much adverse impact. It also depends on economic growth in other countries. If Europe was experiencing strong growth, they would be more likely to keep buying UK exports, even though they are more expensive. 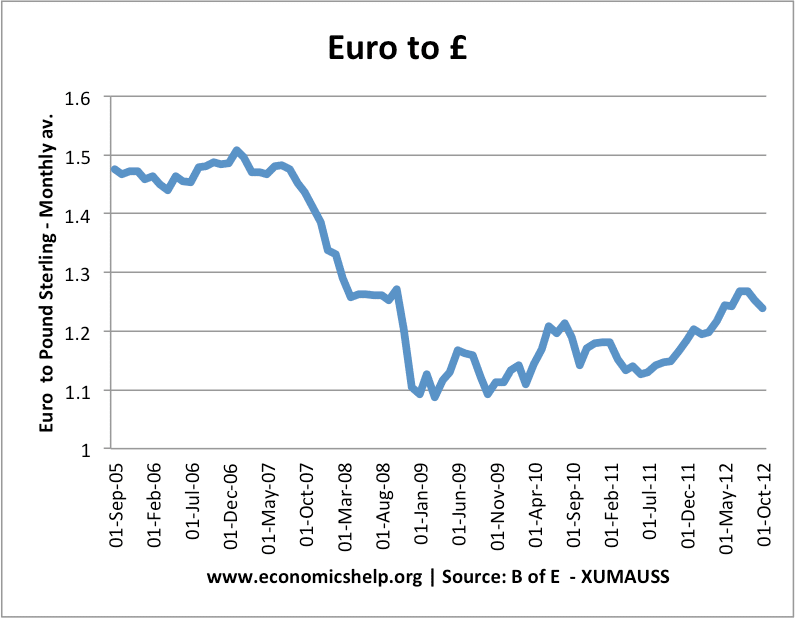 However, in 2012, the EU economy was in a recession and therefore was sensitive to the increased price of UK exports. It also depends on why the exchange rate is increasing in value. If there is an appreciation because the economy is becoming more competitive, then the appreciation will not be causing a loss of competitiveness. But, if there is an appreciation because of speculation or weakness in other countries, then the appreciation could cause a bigger loss of competitiveness. Is an appreciation good or bad? An appreciation can help improve living standards – it enables consumers to buy cheaper imports. If the appreciation is a result of improved competitiveness, then the appreciation is sustainable, and it shouldn’t cause lower growth. An appreciation could be a problem if the currency appreciates rapidly during difficult economic circumstances. 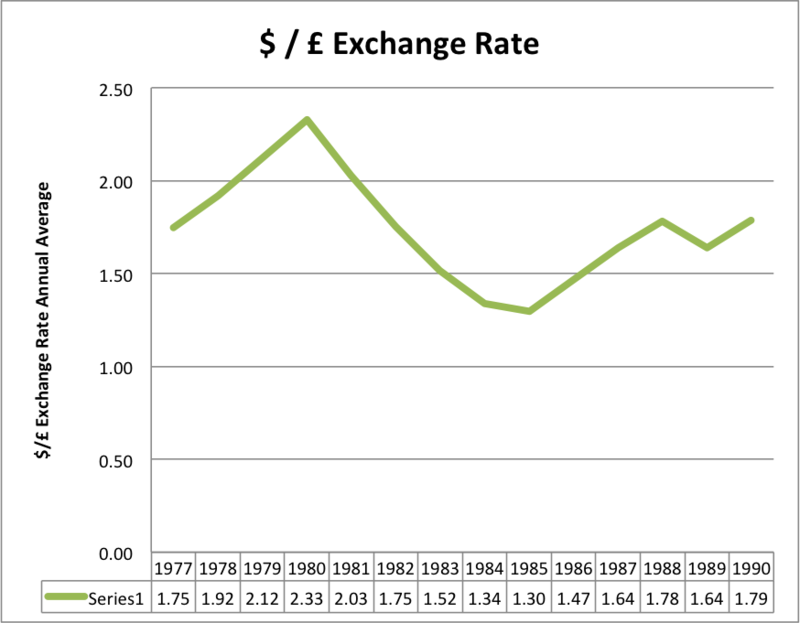 For example, in 1979 and 1980, the UK had a sharp appreciation in the exchange rate, partly due to the discovery of North Sea oil. The value of the Pound increased from £1=$1.5 to £1 = $2.5. However, this appreciation was a factor in causing the recession of 1981 – which particularly affected UK exports and manufacturing. 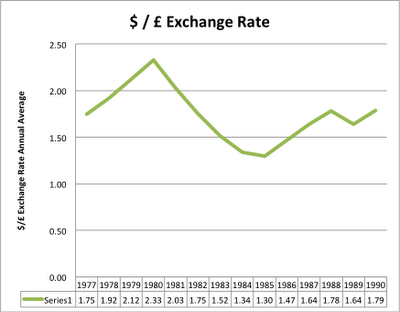 This entry was posted in economics and tagged exchange rates. Bookmark the permalink. ← How can the government avoid public sector failure? the only problem with the appreciation is it makes the exports expensive which in turn will affect the economy after some years. so according to me the ratio of imports and exports must be maintained properly. 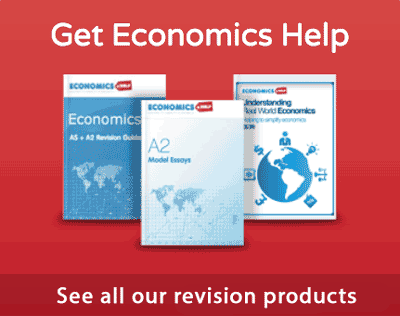 will appreciation induce deflation ? 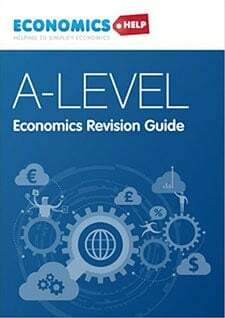 appreciation will to some extent induce deflation since imports will be cheaper and domestic producers will be now loosing the market as their prices will be high so they will reduce their prices so as to fight competition against import prices and attract consumers to shift and buy domestic products. Foreign investment will fall in case of appreciation and pull out of the domestic country since it will be more expensive for the foreign country’s currency to convert into the domestic country’s currency after the rise in the exchange rate. Local investment will also fall since exports will become expensive and foreign country’s may switch to cheaper exports from other countries. It will be more expensive for the local investors to undertake production for exports since entrepreneurs are often profit maximizing. However, this happens when the PED for the exports is elastic. In case of inelastic goods, exports revenue may actually rise and local investors will gain from the appreciation of the currency. does appreciation cause a deficit or a surplus? if a country still has fixed exchange rate system (e.g domestic currency is pegged to the dollar) and displays a large imbalance in balance of payment in form of a current account deficit then what can b e potential monetary medium to long term problems the country may face? The UK is in a unique position where it doesn’t really have much to export – especially products that will be effected by fx (north sea oil etc…). It’s therefore more suited to following an economic policy that keeps the GBP at a stronger level, since it has little to gain from exports. The stronger GBP would also mean that the UK is able to benefit from being a strong currency haven that is able home in as a banking center. can lower unemployment in a country lead to a country’s currency appreciating?